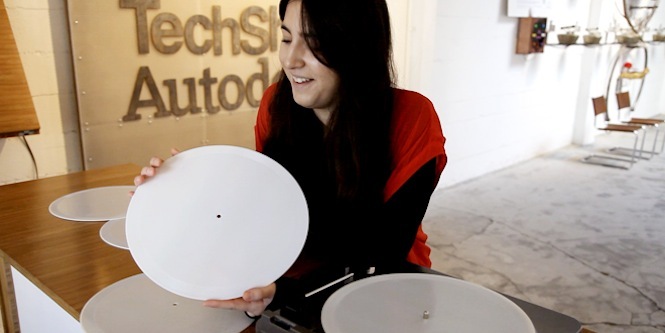 At the end of last week, engineer Amanda Ghassaei caused quite a stir as her laser-cut wooden recording of Radiohead’s “Idioteque” went some kind of viral across several online music magazines. 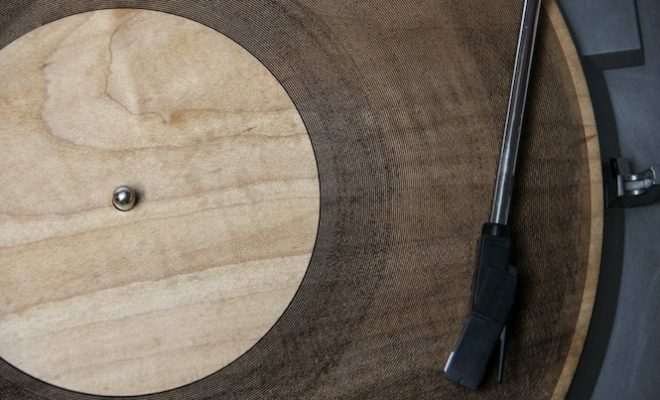 While hearing Thom Yorke’s inimitable timbre through the whine of maple on the world’s first wooden record captured our imagination, the possibilities afforded by Ghassaei’s code, now available for anyone to download from Instructables are perhaps more exciting. While still in fledging form, 3D printing or laser-cutting your own your own records may well offer the first feasible alternative to centralized record manufacturing. As the sawdust settles, we caught up with Ghassaei from her base in California to discuss the process behind these wonderful prototypes and what it could all mean for the future of the humble LP. 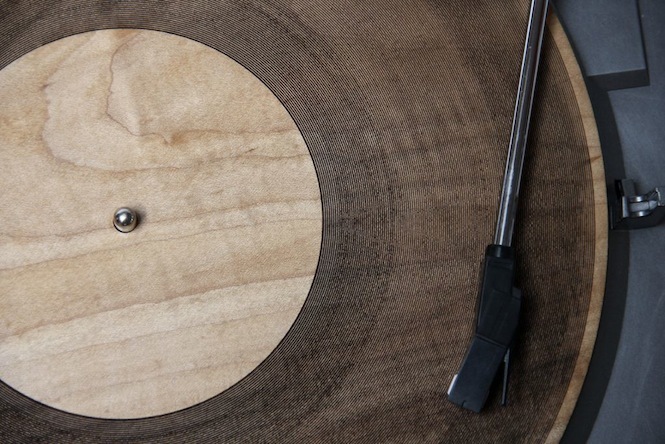 First a 3D printed record, now a laser-cut wooden “vinyl”. What interested you in working with records? Originally I was just curious about the physical limitations of the 3D printer in our office. I knew it had micron precision, and after doing a few rough calculations, I started thinking that printing a record might actually be feasible. The laser cut records were an extension of this project, they were a way for me to open the technique up to a much broader audience (laser cutters are much more accessible than precision 3D printers) and test a wider range of materials. How do you rate the outcome of both experiments? I actually think the laser cut records were more successful. With the laser cut records, I have no problem cutting both sides of the record at full precision, I can use many materials, and I think the audio quality is slightly better. Again, my original intention with the laser cut records was to make this project more accessible, I’m curious to see what other people do with my code. Do you have any intentions on where this project might lead now that it’s out in the public domain? I have no idea where this will end up. I’d love to see this technique applied to even more materials, maybe even to different shapes. I’m interested in the idea of replicating something like an Edison cylinder with the laser cutting or 3D printing techniques. The fun part of this for me is to see what people do with it, I’m looking forward to seeing some outlandish applications of the concept. There are so many different disciplines involved in the production of a wooden record, but do you approach these projects from a musical, technological or an artistic angle? For me these projects are primarily geometry and fabrication problems. My main intention with them was to try to push the limits of the tools and techniques. I do a bit of work with audio as well, so it’s fun to get to work on a project that merges these interests. But sound seems to have played a big part in your work, even before you began experimenting with records. Most of my projects focus on creating physical interfaces for the manipulation and control of audio in various ways. Using modern technology and digital signal processing, many new physical interactions can be explored, interactions that would have been impossible twenty years ago. Vinyl is a compelling medium (and tape too) because it is an elegant, lo-tech solution to making audio physical. It allows sound to be touched and rearranged, it intertwines the audio with the physical properties of the material and allows the listener to leave their own mark on the medium as it slowly wears down from use. The fact that the record is made of wood has really captured the imagination, but what kind of effect do the different materials have on the sound itself? It’s not so much about the material as it is about the machine, to get the best fidelity from a record you have to cut it on a lathe, preferably using analog techniques. There are some inherent problems with using an x/y positioning cutter to make a round cut. With this project I wanted to try to get the best possible cut using the tools as is, but with further modification, I think this technique could be refined to produce much better sound. The fun with using the laser cutter is that you can try out all kinds of materials (wood and paper interest me the most), but there’s no reason why you couldn’t modify a laser cutter to have much higher precision than what I was able to achieve. That said, the type of material does play a role in the audio output. For example, there is a difference between acrylic and wood, the wood has much more noise as the needle moves across the grain. As for types of wood, I haven’t experimented enough to say. From what I’ve found, hardwood is better than ply, as the material is more consistent. As for the future of record production, are these techniques capable of challenging centralised record pressing? I’m not sure any of these ideas will ever overtake the current industrial processes that are used to create vinyl. I think the appeal of these techniques is for DIYers to get to experiment with the process by creating their own custom one-offs. The wood records seem to intrigue people quite a bit, I could see those potentially being manufactured as collectors pieces. Visit Ghassaei’s website for more details or check out Instructables to download your own laser-cut codes.